Yesterday, Apple launched the latest version of the popular iPhone. It’s thinner and lighter than the iPhone 4S, the back and sides being made of a single piece of aluminium rather than glass, so it’s much more durable. The iPhone 5 is 18 percent thinner and 20 percent lighter than the 4S. It’s taller but not wider, so it’s still easy to use in one hand, and it has been re-designed to include a 4 inch Retina display, so more apps can be viewed on each screen. It has an Apple-designed chip, making its performance twice as fast as the 4S, and giving significantly better battery life. The iSight camera has more features, including an option which lets you take panoramic photos in one smooth motion. A new FaceTime HD front facing camera makes FaceTime calls clearer and can also be used for self portraits and recording HD video. There’s also improved stabilization when recording video and the ability to take still shots whilst recording. iPhone 5 also allows you to share photos using iCloud’s Shared Photo Stream. It comes with a new connector that is smaller, smarter and more durable than the connector on previous versions of the iPhone. 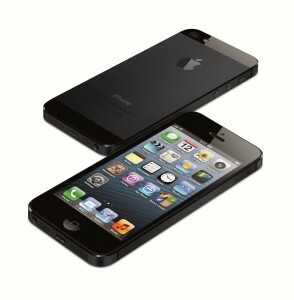 The iPhone 5 comes in white & silver or black & slate. It will be available in the US, UK, Australia, Canada, France, Germany, Hong Kong, Japan and Singapore on Friday, September 21. Customers can pre-order iPhone 5 beginning Friday, September 14. It will be rolled out to a further 22 countries on September 28.
iOS 6 will be available on Wednesday, September 19, as a free software update. iPhone in easy steps, 3rd edition, covers iPhone 5 and iOS 6 and will be published before Christmas. We’ll add publication details to our website as soon as we have more information on the date, so keep checking back!